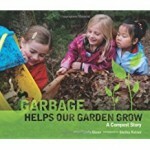 Linda Glaser’s book, Garbage Helps Our Garden Grow, follows the activities of a family as they create a compost pile for their vegetable garden. They put in everything from Dad’s coffee grinds to leftover lettuce and peanut shells, adding grass clippings, their moldy jack-o’-lantern from Halloween, and wilted flowers. The children spray the debris with water to keep it moist, watch Mom turns over the whole pile, and help Dad mix the compost into the soil to prepare their garden for planting. They enjoy the worms in the compost, the earthy smell, and the volunteer seedling from their Halloween jack-o’-lantern. When their own crops come in they appreciate the compost even more. The text is enhanced by large color photos showing the various activities described including the kids handling rotting vegetables, scraping their plates into buckets, and handling a worm. A final full page photograph shows a tractor spreading garbage in a landfill with the reminder that the more we compost, the less garbage we throw out, and the less garbage ends up in the landfill. Two end pages answer questions adults might have about composting. An excellent introduction to the subject showing the nits and grits of the process and how everyone can contribute. Amazon’s price of $70.09 is excessively high compared to Barnes and Nobles’ of $25.32 even considering shipping. 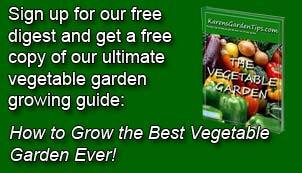 To buy Garbage Helps Our Garden Grow from Amazon.com Click Here.